Samurai Jack is awesome, but gushing about it is for another post. However in an episode our hero is in a forest. He is making himself some food. He takes a small branch from a tree removes the tough bark from the outside of it with a knife. He then pulls it apart into two long pieces of clean wood that he then uses as chopsticks to both cook and eat his food. All I’m saying is – when you’re lost in the forest you will be hard pressed to find a way to whittle a fork and spoon using your teeth. 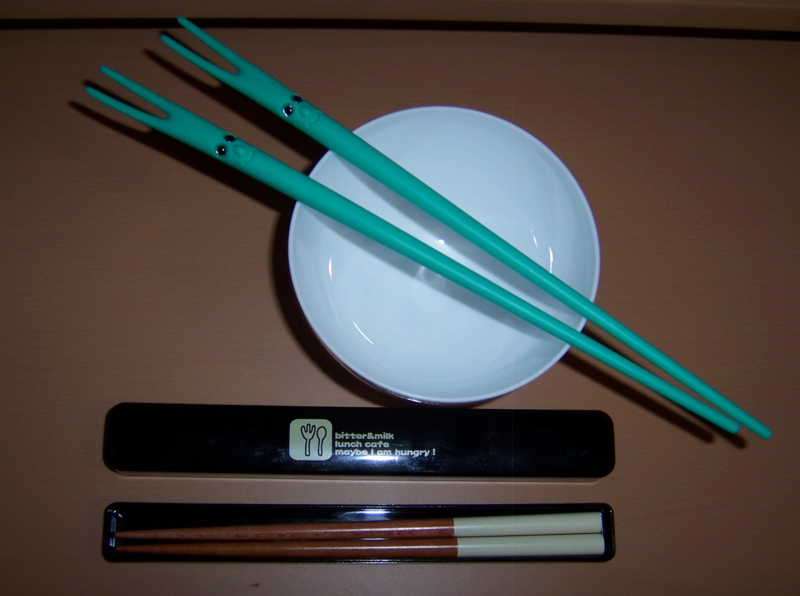 A pair of chopsticks are easy to make if you put a bit of effort in. That is an Awesome Geek survival tip for you. However I think chopsticks are nifty dinner tools as they are fun to use for someone like myself who has not grown up using them. They also make you eat slower and take smaller bites, thus allowing you to enjoy your food more and digest it easier. Plus fun ones with faces on them like the ones pictured can be purchased and how can you say no to that? This entry was posted in Kitchenware and tagged Chopsticks, Fork, Knife, Samurai Jack, Survival Tip by Jonathan Day. Bookmark the permalink.